You can find details of this project on Ravelry. A few weeks ago, Kathleen Mary asked what Ravelry was and I thought I’d take a moment to explain in detail. Unless you are a knitter or crocheter, you probably aren’t aware of it. Ravelry is a website – ravelry.com – and I can be found on it as mellies1000needlz. It’s where knitters and crocheters gather. I think spinners and dyers too?.. In a nutshell, we can post projects, find/buy/keep patterns, manage the yarn stash, etc. I’m relatively new so I don’t use it as extensively as it could be used. I watch a bunch of knitting podcasts and it seems that having a Ravelry group is a must have for knitting podcasts. It’s a way to take part more actively in the community. 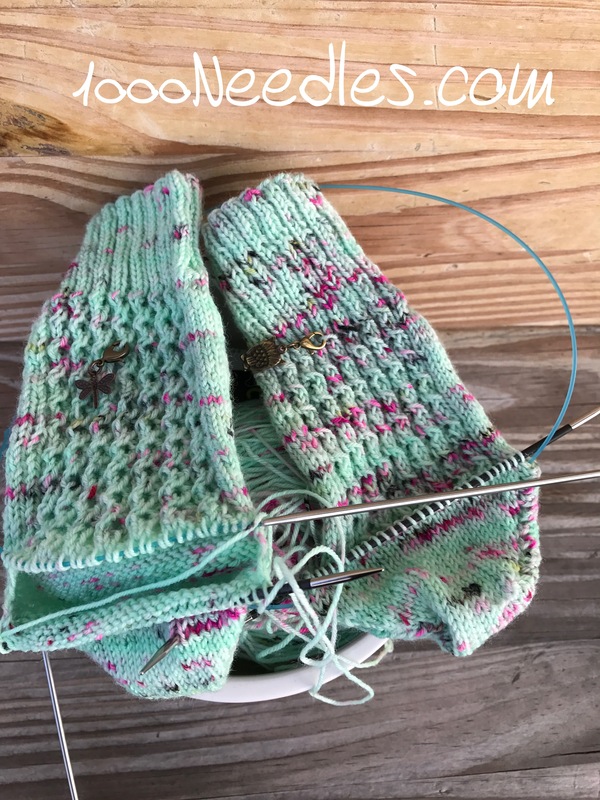 I enjoy the project pages as I can keep my project, who its for, the needles I use, the yarn I use, with the pattern and add any notes I want to add without fear of losing it. This is especially useful with socks as I haven’t yet found my sock recipe and I’m still tweaking it with every new sock I make. In addition, you can search and find different patterns. You buy them and keep it in your library for whenever you are ready to use the pattern. I would like all my yarn to eventually be listed on the site. I have a stash, it’s not as big as some people’s and it definitely not as big as my fabric stash. But it’s overflowing the small basket I had originally assigned to contain my yarn. I’m trying to knit as fast as I can (I’m a really slow knitter) and use up what I’ve got but I keep buying more yarn. I’ve already bought yarn from all the indie dyers I wanted to buy yarn from so the buying is slowing down. Anyway, I’ve been participating in the Knitting Expat podcasts “New York Sock Club” and this month she released the Union Square sock. It was a bit challenging for me and it took me awhile to get the right side pattern look right. I was able to get the left side looking beautiful but I had to rip the right side a few times before I figured out what I was supposed to be doing. I love the yarn and how it is knitting up. I’ve just finished the heel for both socks so tomorrow I’ll work on the next step. I can do very basic knitting. I wouldn’t even dare try socks, so I’m totally impressed. Fun to see what you are working on! Thanks Wendy! I just started seriously knitting recently though I’ve tried for many years. In the past my hands would hurt and I’d put projects away. At some point I realized that I needed to upgrade the tools (needles) I use to prevent that and it’s been much better. Thank You. I know how it knit, but it frustrates me because I knit way too tight. I hve been thinking about trying to knit socks. Maybe if I tried a sock for me, it might fit my grandchildren.